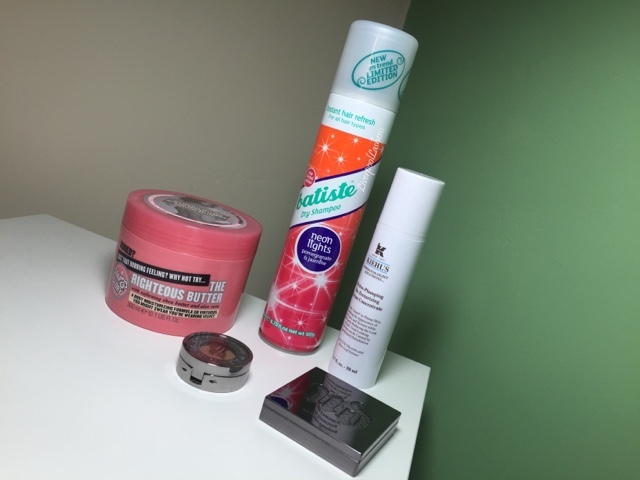 It's been a while since I spoke about my current beauty loves so I thought I'd run through a few favourite items! After seeing how dry my skin has been recently I've been trying to step up my moisturising game with Soap & Glory Righteous Butter. The scent is classic Soap & Glory and it leaves my skin feeling brilliant. Next up is Batiste Dry Shampoo in Pomegranate & Jasmine. I really hope that this scene isn't limited edition because it's gorgeous but I truly adore Batiste and this works well and has this amazing fragrance. Kiehls Hydro Plump Retexturising Concentrate is a firm favourite to keep the skin on my face hydrated and plump. It's fantastic under make up too! The final two products are from Urban Decay. The blush is in "Video" and it's a brilliant shade that's somewhere between a blush and a contour. The other is a new eyeshade called "Backfire" which I like to put on my crease for a subtle polished look for daytime make up. Both are demfinitely a must for your make up bags!